Today's Style Saturday post is inspired by one of my favourite things in the world - and I'm totally not biased! LipSense is one of my favourite makeup products and I genuinely feel bare without a colour on my lip. 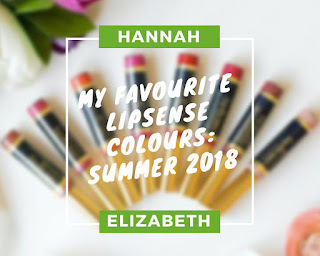 I've done a few Favourite LipSense editions but this Summer Edition is making me so excited right now. I usually do 5 but I couldn't pick just 5 so I went for 6. 1. Honey Rose: This is my all time favourite LipSense Lip Colour! It's a beautiful rose gold with an amber frost. It's not quite a true coral but I've also been loving Summer Sunset and Heartbreaker. 2. Bombshell: I've always loved Bombshell because it goes with everything but I've been loving it for nights out recently. I've been enjoying wearing a bolder eye with a softer lip colour. 3. Plumeria: Who doesn't love a bright lip in a heatwave?! I've been loving this dark pink, topped with a golden shimmer. 4. Goddess: This shows up as a soft pink on most people but it's been showing up as more of a purple-pink on me recently and I love it. 5. Fly Girl: I can't lie, I'm not a massive red lipstick wearer but I think the sun's changed me. When I bought a couple of red cami's from Dorothy Perkins, I knew exactly which colour I was going to pair them with...Fly Girl! 6. B. Ruby: Finally, my sixth but by no means least top pick is B. Ruby. Another bold lip colour but it's a red-purple. I've been missing the purple lip colours but I think I'm going to save most of them until Autumn/Winter and while I wait, this is the perfect summer option. Do you love any of these colours? Don't forget if you want LipSense for yourself you can buy through me. If you want more inspiration be sure to check out last year's Summer favourites, my Winter Edition and my Valentine's Edition!